Presented release Cairo-Dock 3.2, visually rich panel for launching programs, are used to organize the output library Cairo. 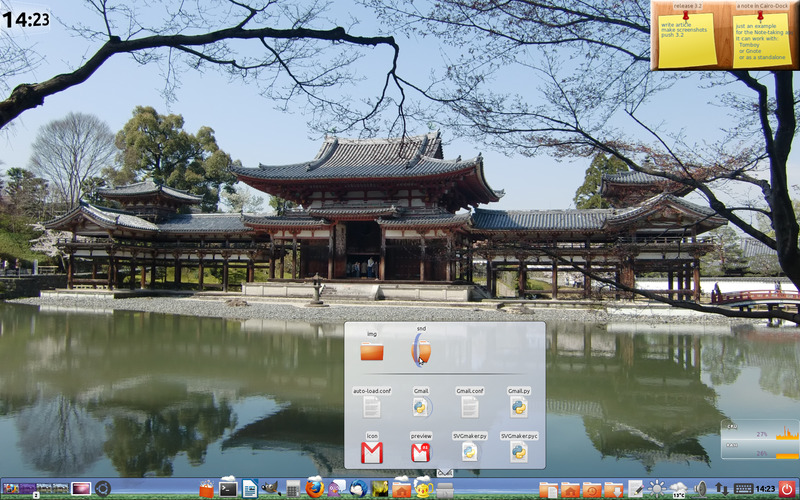 Cairo-Dock can run on any hardware, any window manager, integrating with most desktop environments, including acting as a replacement or supplement to the Unity, Gnome-Shell, Xfce-panel and KDE-panel. On modern systems use OpenGL and modern visual effects, and the legacy systems panel works in simple mode, consuming a minimum of resources. With flexible enhancements are Cairo-Dock is not limited to running programs, allowing you to select plug-ins with the implementation of new visual effects and applets with the implementation of additional actions, such as a map of the state of the mailbox, sending and receiving instant messages, control of the media player, RSS-tracking tapes, view the status of torrent downloads, displaying weather, output assignments from a calendar planner, etc. Binary packages so far only available for Ubuntu and Debian GNU / Linux. – In the default theme design improved integration with KDE.